Home News Access Can Portable Schools in India Keep Kids Off the Streets? A teacher sits with Vishal Pawar at Signal School. THANE, INDIA — Vishal Pawar was 13 when he first slit his wrist. His suicide attempt was perpetrated by a terrible dilemma: A schoolteacher’s insistence that he give up begging at traffic signals, something he’d been doing all his life. The boy had seen merit in his teacher’s suggestion. Focusing his attention on school would pay off in the long run, Pawar believed; begging was a crutch, if a survivalist one. But that teacher’s demand was at direct odds with his stepmother, who would beat him if he failed to collect INR 100 ($1.53) at the end of each day. Pawar had no one to turn to for help; his father, who migrated with his family from a drought-stricken Indian village to Mumbai, was in prison for theft. The assaults he suffered at the hands of his stepmother were getting more violent by the day. Following Pawar’s suicide attempt, his teachers organized a 15-day counseling session, where he confided about the pressure at home. His stepmother was subsequently counseled. Now a seventh grade student, Pawar is one of the 48 kids at Signal School, India’s first such institution to specifically provide education to underprivileged children living at traffic signals. The school operates out of a remodeled shipping container at a busy traffic junction in Thane, a city on the outskirts of Mumbai. The exterior of the container is painted in bright yellow and depicts a sketch of a city skyline. Inside, there’s a classroom, an audio-visual system, a library with 400-plus books, and individual lockers for students—all side-by-side within the 30-by-10 husk. Started in 2016 as a joint initiative between the city of Thane, which neighbors Mumbai, and Samarth Bharat Vyaspith, an education non-profit based in Mumbai, the school aims at integrating migrants’ children into mainstream education—the same kids who are so often deprived of schooling and forced by their families into begging and child labor. Mumbai, home to 18 million people, is considered to be the financial capital of India. It has long been a magnet for migrants, who flock to the city from all over the country in search of better economic prospects. According to a United Nations report, the city is estimated to grow by 51 people every hour, and its population is projected to reach 28 million by 2030. Prakash Reddy, the general secretary of Brihanmumbai Bhadekaru Parishad, a non-profit organization that fights for the rights of tenants in Mumbai’s slums, says that, despite the swelling numbers, there is a critical shortage of affordable housing in the megacity, which drives migrants to a difficult life in informal settlements: Many sleep on the streets of Mumbai and adjoining cities like Thane. For the children of those migrants, that means losing education to greater priorities like shelter and basic income. “Children lose out on education, and are forced into child labor to support their families,” Reddy says. According to a 2013 census study, Mumbai is home to 37,059 “street children”; at least half of them work as child labor—begging, rag picking, selling knick-knacks at signals, construction work, among other odd jobs. Twenty-four percent of these children are illiterate. The Right of Children to Free and Compulsory Education Act (RTE), ensures free education for Indian children up to 14 years of age. However, Bhatu Sawant, the secretary of SBV, says the benefit hardly extends to street children. In 2015, one year before Signal School opened, SBV conducted a survey of children living in the shadows of highway overpasses in Thane. The surveyors identified 93 such children, all of them education-deprived—either dropouts or uneducated entirely. 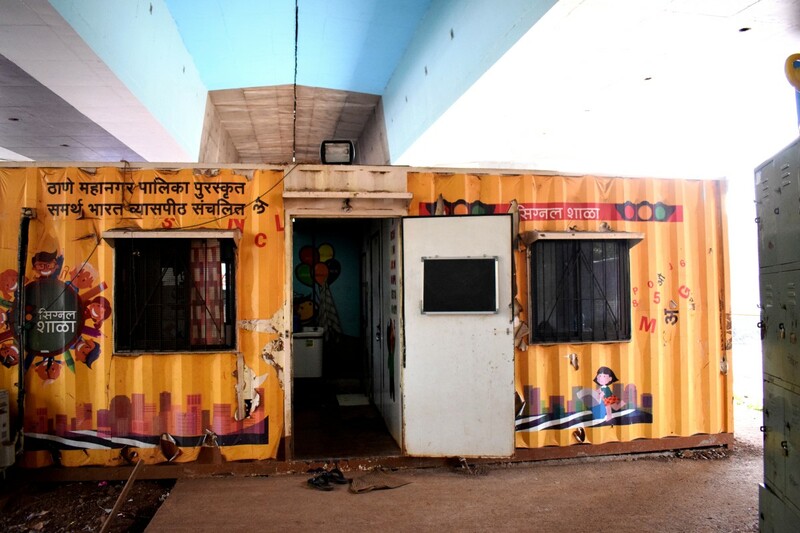 The remodeled shipping container that houses Signal School in Thane. After SBV social workers behind the survey quickly realized “street children” wouldn’t attend government schools, SBV decided to make attendance easier for the kids, by bringing the school to their homes—on the street. They identified as a prime location the Teen Hath Naka overpass in Thane, which has 22 roads, and where 17 migrant families had been living for over two decades, begging and hawking at the busy traffic junction. With 12 children from these families, the school opened in June of 2016. From the start, there were plenty of challenges to educating the kids. Per RTE, children are allotted classes in accordance with their ages. However, with street children, whose ages range from four to 14 and who had varying levels of education, such simple structure was impossible. Hence, students were divided into four groups following an IQ mapping test, and each group was allotted one teacher. Language was also a barrier, and teachers had to learn the students’ native language to facilitate better communication. Apart from books and uniforms, the school also provides meals, a benefit that quickly attracted other nearby street children. Attendance numbers started spiraling: By April of 2018, the school had amassed 48 students. “Gradually, each of the 17 families was convinced. The parents noticed how the school was changing their children—the kids became more respectful, got healthy because of timely meals, used less abusive language, and appeared to have the possibility of a bright future,” Parab says. Jalinder Pawar, 46, came to Mumbai from his drought-stricken village 23 years ago. With his daily earnings of INR 400 ($6), he was unable to afford a home, and had to leave his two children behind in the village. He and his wife, who also left the village, have been selling flowers at traffic signals since. After Signal School opened, Jalinder brought his two sons, ages 12 and 14, to Mumbai. The boys, who were deprived of education since there were no schools in their remote village, are now students at Signal. “My parents never insisted on education, and I know that that fact has crippled me all my life. I won’t let that happen to my boys,” Jalinder says. Signal School’s schedule—classes run from 10 a.m. to 7 p.m.—was purposely designed to coincide with the heaviest traffic hours, ensuring that kids would be in school and not begging for money. (Parab says, speaking perhaps hyperbolically, that the money earned by these children from begging is always spent by their fathers on alcohol and gambling.) But survival is a 24-hour operation, and many children return to the streets to beg as soon as the final bell rings. Nine-year-old Nikita Pawar, for example, picks up her brother, Sham, six, who is also a student at Signal School, and walks him to a traffic signal nearby soon after the last class is concluded, at which point they sell everything from bottled water to cell phone cases. Nikita Pawar and her brother, Sham, still sell trinkets at traffic signals after finishing classes at Signal School. Because economic despair is the most pressing concern for migrant families, Signal School has now started helping families of its pupils to find permanent accommodation. Since January, the school has been renting each of its families one 100-square-foot shanty, located in a nearby slum. The non-governmental organization has paid the INR 20,000 ($308) security deposit for each family, and has also funded their first month’s rent of INR 2000 ($31). Manish Joshi, the deputy municipal commissioner of education with Thane’s civic authority, says integrating students’ families into the initiative is vital since many parents still object to education. “With its recent work, Signal School is also addressing socio-economic factors, which hamper street children’s education,” he says. The Maharashtra government has recognized the initiative as an ideal way to facilitate schooling for urban street children. However, replicating the model everywhere is highly impractical. Sawant says the foremost difficulty in duplication of the model is the lack of funds with non-governmental organizations. Current monthly expenses for running Signal School are INR 0.2 million ($3,030), and non-profit organizations cannot commit to such an initiative until they have a promise of donations for at least two years. “You cannot stop the school abruptly if you are unable to arrange the money. That won’t help the kids. Plus, there are other complications like securing land for the school, getting government permits, getting the school registered, among others,” he says. 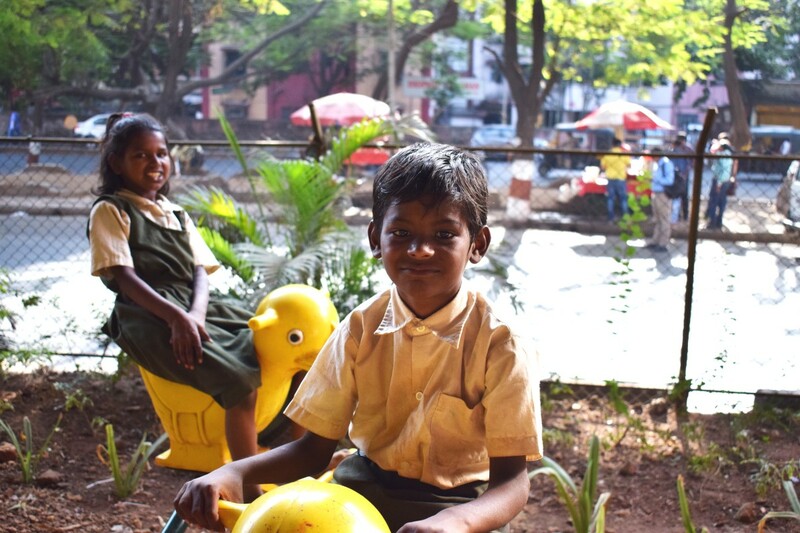 Reddy, the Brihanmumbai Bhadekaru Parishad’s general secretary, feels that, while Signal School is a “good initiative,” there’s still a “pressing need” for broader efforts aimed at addressing homelessness and the lack of basic amenities for millions of migrants in Mumbai. Namely, he’s calling for a more involved government. A planned economy, Reddy adds, will break the pattern of uneven development in India, ensure equal distribution of opportunities, and migrants won’t be compelled to leave their homes. But for those attending Signal School, the institution is more than just a source of education. Thirteen-year-old Shankar Pawar, for example, lost his right heel after a truck ran over his foot a year ago. Teachers rushed him to a hospital, stayed by his bed until he recovered, and paid for the expensive skin grafting treatment.